We know that today’s shoppers are more digitally connected than ever before - that they often do their research online before visiting a store, and that they’re more prone to prioritize value and a good deal over brand loyalty. So it should be no surprise that consumers feel more empowered than ever before. Entitled consumers are changing the world of marketing. But little did we know how profound these changes were. That was before we at Selligent Marketing Cloud embarked on a comprehensive survey, asking over 7,000 consumers worldwide about their views on brands, marketing, and social media, among other topics. Now we have a fuller picture, we’re excited to share with you our key findings. The verdict? It’s a new world full of exciting, but also daunting expectations for marketers. Today we’re zooming in on one particularly important insight from our research: a whopping 42 percent of consumers agree that Companies are lucky to get my attention and they should act like it. When it comes to their expectations from brand relationships, the data reveals that the average consumers tend to be somewhat contradictory: Nearly half of the shoppers we surveyed believe companies should use their personal data to provide better service. But at the same time, three out of four shoppers are also concerned about letting brands to track the behavioral data they need to deliver that service. In other words, when it comes to data collection, consumers want their cake and eat it, too. But at the end of the day, all signs point to consumers wanting brands to be human, helpful, and convenient. Very few consumers report ‘punishing’ a company for safe data collection and usage, as long as they perceived they’ve derived value from it. And value is really the operative term here. What exactly consumers mean by ‘value’ is open for interpretation. But it definitely casts brands into the role of value providers, whether it’s by solving customer problems, or by offering relevant suggestions at the perfect moment, or on the most basic transactional level, by rewarding data sharing with cash. With continued political pressure in the EU and US for privacy regulations and recent data breaches worldwide, the year 2018 is teaching consumers about the true value of sharing personal data. And now, they’re coming to cash their checks. ‘Data-value exchange’ is a buzzword that’s come up many times in recent days and all signs to it being a major factor over customer relationships from here on out. Now that data is the new currency, business models designed to monetize consumer-brand relationships are already out there. In some places, consumer data can already buy shoppers a coffee or a muffin. At the students-only Shiru Cafe in Providence, Rhode Island, customers trade personal information like their names, phone numbers, and email addresses – together with opt-ins for corporate sponsor messaging – in return for free coffee. American life insurance provider John Hancock also offers substantial discounts on insurance rates to subscribers who fork over health data from personal training devices like Fitbit and Apple Watch. The information is invaluable: customers who maintain healthy lifestyles live longer and reduce the number of life insurance payouts. In the big picture, these are just early examples of new business plans and ways for brands to enter the conversation. What all these models have in common, however, is placing a quantifiable premium on consumer data. As relationships gain a more quantified, transactional component, it’s a good time to consider spelling out the terms of the arrangement. Start by walking in your customer’s shoes. In order to deliver the kind of value and experiences consumers want, be sure of what those needs are first and foremost. First of all, once you’ve laid out the kind of personal data you need from your customers and the kind of personalization or perks they can expect in return (e.g. tailored clothing suggestions, taste-appropriate newsletters, $100 gift cards etc. ), you’ve built the foundation for customers to align with your brand. Second, on-taste recommendations served on a customer’s preferred channels are not just a way to flex the latest marketing technology – they can also save your relationship: 65 percent of consumers are likely to switch brands if a company doesn’t make an effort to personalize communications with them. And third, brands build long-lasting customer relationships by taking on the role of value providers. Using all available customer intelligence – blending past behaviors and current situation – empowers brands to serve the level of individual marketing that customers demand and even feel entitled to. 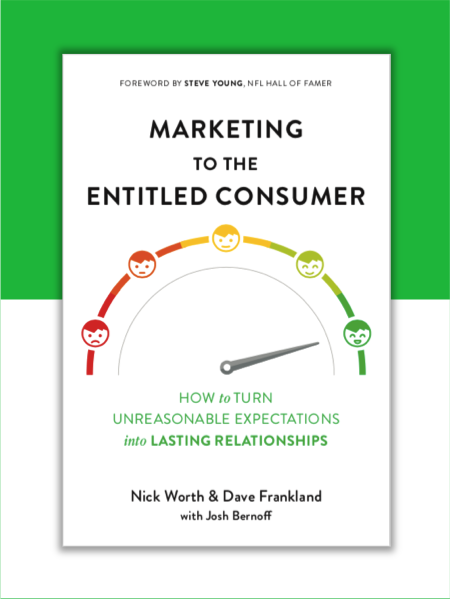 To find out more about how to satisfy increasingly demanding and digitally savvy consumers of today, read the book by Selligent Marketing Cloud’s Chief Marketing Officer, Nick Worth: www.entitledconsumer.com.